An on-location treasure hunt adventure, King Solomon's Mines offers plenty of exotic safari-style thrills but a rather scarce plot. 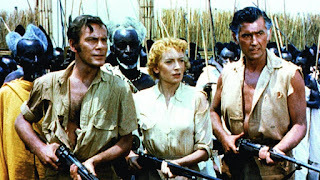 Allan Quatermain (Stewart Granger) is a big-game hunters' guide in deepest Africa, growing disillusioned with his life. 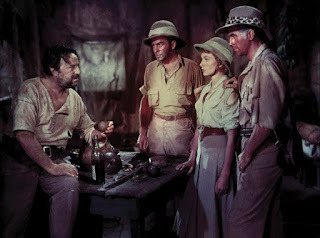 He is offered a large sum of money by the brother and sister team of John Goode (Richard Carlson) and Elizabeth Curtis (Deborah Kerr) to guide them into unexplored and dangerous territory in search of Elizabeth's missing husband, who disappeared while searching for the mythical treasure of King Solomon. The journey is arduous, and features many encounters with wild animals, difficult terrain and hostile tribes. But Allan does pick up clues of the missing man's progress and the party pushes on. They meet a fugitive calling himself Smith (Jugo Haas) hiding in a tribal village, and are joined by the mysterious and exceptionally tall local man Umbopa on a mission of his own. The second of numerous screen adaptations of Sir H. Rider Haggard's 1885 novel, the 1950 version of King Solomon's Mines is perhaps the best known. MGM spared no expense, with the story unfolding in colourful settings, against wondrous vistas, and in various exotic African locations. Co-directed by Compton Bennett and Andrew Marton, the film is a sturdy old-fashioned adventure story, enjoyable for the numerous encounters with wild animals but otherwise stretched for content. In terms of human drama the opening 30 minutes are the most fulfilling. Quatermain is losing his zest for hunting, his sense of living on borrowed time growing thanks to the latest casualty on his team, his enthusiasm waning in inverse proportion to his growing reputation. Elizabeth and John work hard to convince him to lead their ill-conceived search, and finally it's a combination of a ridiculous financial offer and Allan's curiosity about Elizabeth's real motives that engage his motivation. Once the group move into unexplored territory the humans are sidelined and the animals take over, large and small, individually and in groups, on land and in rivers. King Solomon's Mines settles down to a series of sequential encounters with lions, zebras, giraffes, hippos, elephants, crocodiles, tarantulas, leopards and a massive stampeding herd, to name just a few. It's a dream for lovers of nature and wild animals, but the storyline slows to a crawl, barely afforded breathing room amongst all the hooves, claws and paws. In between scenes featuring the animal kingdom, the tension between Allan and Elizabeth slowly turns to admiration, in a predictable but chemistry-light romantic subplot. The drama comes back to life late in the film, but the main characters become observers to a stale and poorly defined tribal civil war. King Solomon's Mines conveys the sweaty beauty of Africa, but fades into a safari trip postcard with a bit of plot on the margins of the pretty pictures.